Pro Tip: Mix a couple ounces of CarPro Reload with your next RTU bottle of Ech2O for added protection! Waterless Wash, High Gloss Detail Spray, Rinse-less Wash, and Clay Lubricant EcH2o is an entirely new waterless cleanser and gloss-enhancer built on 2 years of research and development by CarPro Chemicals! EcH2o was designed to work in harmony with ceramic coatings and even provides easy cleaning of non-coated or waxed surfaces! Based on a SiO2 hybrid framework and an eco-friendly organic lubricant solution, EcH2o safely cleans and glosses a variety of exterior vehicle surfaces with ease! Paint and chrome take on an entirely new level of gloss and reflection with this incredible formula and better yet it is easy to use even in extreme heat and direct sun on painted surfaces! Our solution to providing a swirl free and eco friendly waterless experience is a blend of proprietary lifting agents combined with natural organic extracts and lubricants. 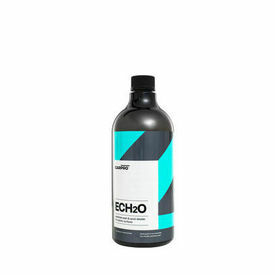 The secret to the safe cleansing abilities provided by EcH2o is a combination of its modified high gloss SiO2 component and its innate cleansing abilities, which easily removes dust and light dirt whilst leaving behind a wet, glass-like surface! The finish left by EcH2o mimics the incredible properties that have become synonymous with CarPro SiO2 sealants and CQuartz coatings throughout the years! In conjunction with a quality microfiber towel, the lubricants aid in safely removing the larger particles from the surface while the remnants of the EcH2o solution become an active cleaner across the surface and begin to loosen any particulates that were left behind. Before the final step (noted in the product directions) the solution may dry to a fine haze indicating it is ready to wipe off any remaining product effortlessly! Features: High Gloss SiO2 Hybrid Detail Spray Incredible waterless wash! Also excels at rinse-less, & clay lubricant Safely cleans without swirls Works great even in direct sun Eco Friendly Amazing on chrome Excellent on rubber and plastic trim - Does not stain Fast & Easy Versatile, works well on many materials Works great on both coated and un-coated vehicles Dilutions: 1000ml makes up to 4 Gallons of (1:15) Waterless Spray 1000ml makes up to 6 1/2 Gallons of Quick Detailer (1:25) 1000ml makes up to 10 1/2 Gallons of Clay Lubricant (1:40) 1000ml makes up to 53 Gallons of Rinse-less Wash (1:200) Directions: Quick Detailer: Shake well and dilute 1:15 ~ 1:25 Spray, spread, and wipe off completely Waterless Wash: Shake well and dilute 1:5 ~ 1:15 Spray liberally across one entire panel Lightly wipe with CarPro BOA towel flipping towel to fresh sides often Spray once more across panel surface Using a fresh BOA towel wipe surface removing remainder of dust and dirt Move to next panel, repeat steps 2-5, and continue around vehicle Final wipe entire vehicle with a fresh clean towel as needed Clay Lubricant: 1:40 Rinse-less Wash: Mix 3 gallons of water with 2-3 ounces of Ech2o in a bucket with Grit Guard Fill another 5 gallon bucket with grit guard and ONLY clean water Submerge BOA or Crazy Pile Microfiber Towel in the solution bucket Fold Towel in half and drag slowly across surface no pressure across 1/4 of a panel Flip Towel and do a couple other passes on the next 1/4 of panel Flip Towel In side out and repeat using all 4 sides to complete one panel Use a seperate clean soaked towel for final buffing wipe Use a DRY summit 800 or suitable drying towel to dry the panel completely before moving on to next panel Wash the dirty towels in your rinse bucket OR use a new towel submerged and repeat steps 3-8 Wash all towels in washing machine with Micro-Restore when complete Precautions: Test product on inconspicuous area before use Store in cool dry place Keep away from children Do not ingest CarPro Ech2O FAQ: Can I use Ech2o in the sun as a waterless or detail spray? Absolutely, it works very well even in direct sun. Can I use Ech2o as a rinse-less wash? Yes! Our Rinse-less wash testers found Ech2o to perform better than the products they have used until now. Is Ech2o a cleaner? Yes, it is a waterless wash that’s tough on dirt but gentle on the vehicle. It gently lifts dirt and contaminants from the surface. Does Ech2o have protection in it? Ech2o does have some Sio2 (quartz) protection in it BUT its main focus is on safely cleaning and glossing a variety of surfaces. Pro Tip: Mix a couple ounces of CarPro Reload with your next RTU bottle of Ech2O for added protection! Can I use Ech2o as a wipe down before coating? No, the organic lubricants in Ech2o are GREAT for aiding in safe quick detailing but lubricants can hinder the bonding of CQuartz to the surface. For that purpose, stick with Eraser for a wipe-down solution. That is what Eraser was designed for. Can I use Ech2o for wiping down a car that I just coated? That depends on your definition of “Just”. Ech2o has very effective cleaners in it so we do NOT want to introduce a cleaning solution to a ceramic coating that is STILL undergoing a very complex curing process. IF you mean just before or after delivery / wiping off dust then yes. In that case dilute Ech2O 1:25 and gently remove any dust. How do I use it? As a high QD dilution – Spray and wipe. For waterless - take a look at this video: https://www.youtube.com/watch?v=gGJvQ-Kromk Why do you have a range of dilutions mentioned? There are a lot of variables in detailing. Level of dust and dirt, temperature, humidity, preference, technique, and existing surface protection are just a few of the variables. In general we would recommend you start with 1:15 for waterless wash and 1:25 for Quick Detailer. Can I use Ech2O on Chrome? Oh Yes! It leaves the chrome incredibly clean, slick, and glossy! Can I use Ech2O on Glass? Yes, it works excellent! Can I use Ech2O on interiors? You can use Ech2O on some interior surfaces but we would recommend using CarPro Inside for most interior surfaces!